The Wee Lodge is a detached lodge situated in Glendevon Country Park, Scotland. Inside it has two bedrooms: one double with an en-suite shower room and WC and one twin. There is a separate bathroom and WC. It has an open-plan living room with a fitted kitchen and dining area, as well a utility room. Outside has a small stone garden area with a shed for bike storage. Off-road parking is available for 2 cars. 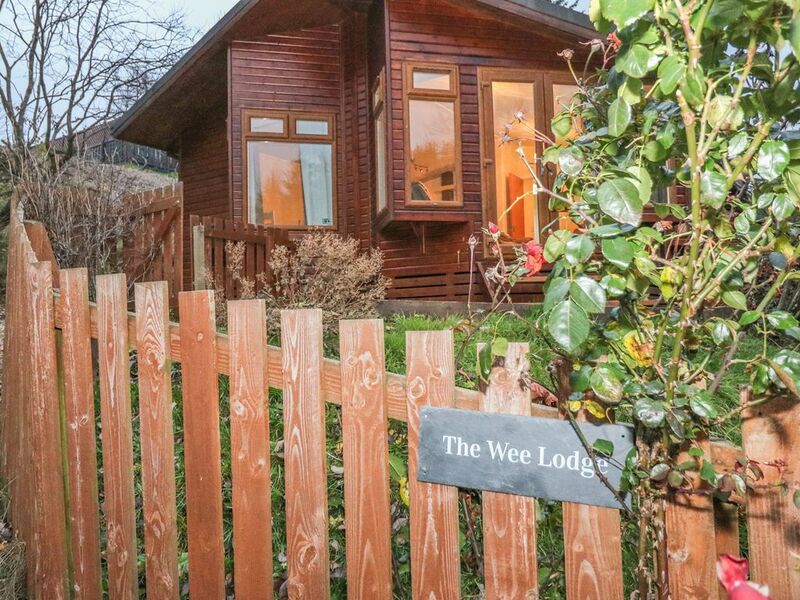 The Wee Lodge is ideal for a couple or small family to enjoy the town and explore the local area. Amenities: Boiler, electric fire. Electric oven and hob, dishwasher, washing machine, smart TV and WiFi. Bed linen and towels inc. in rent. Off-road parking for 2 cars. Small enclosed stone garden. Pets are welcome. Sorry, no smoking. Shop and pub 6.1 miles. Region: From the lush green farmlands of the Borders to the ruggedness of the Highlands, the Scots are proud of their land and identity. Scotland also has some of Britain’s best beaches with glorious stretches of clean sand over which to roam. Town: Dollar is a small town in Clackmannanshire, Scotland. It is one of the Hillfoots Villages, situated between the Ochil Hills. Dollar is now mainly residential; however, for a long time it was known for its industries. Attempts were made to mine lead and copper in Dollar Glen from the 18th century and possibly earlier. There are various sports facilities, including an 18-hole golf course (notable for its steep inclines and lack of bunkers), a tennis club, a squash club, a bowling club, and a cricket club. Two bedrooms: 1 x double with an en-suite shower room with a shower, basin and WC and 1 x twin. Bathroom with a bath, basin and WC. Open-plan living room with a kitchen, dining area and sitting area. Utility. Boiler, electric fire. Electric oven and hob, dishwasher, washing machine, smart TV and WiFi. Bed linen and towels inc. in rent. Off-road parking for 2 cars. Small enclosed stone garden. Pets are welcome. Sorry, no smoking. Shop and pub 6.1 miles.